three + 5 = Required Please enter the correct value. (Kitco News) – Global stock markets were mostly firmer overnight. Corporate earnings reports are presently garnering attention of equities traders. Reports said the Volatility Index (VIX) has dropped to its lowest level in a decade early this week. In technical jargon, this is called a collapse in volatility, which precedes bigger price moves forthcoming. In layman's terms it's called the calm before the storm. U.S. stock indexes are pointed toward narrowly mixed openings when the New York day session begins. 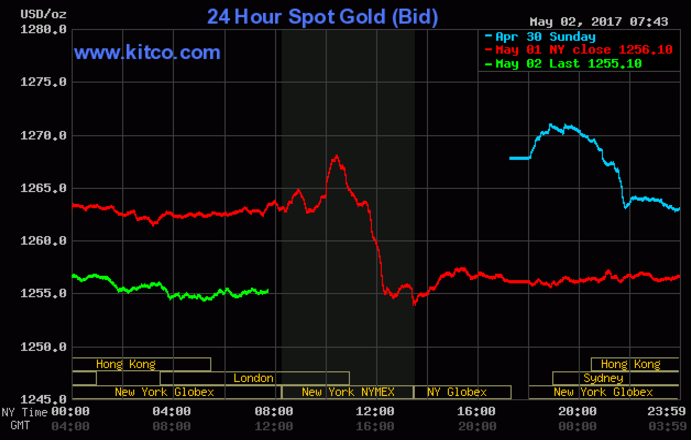 Gold prices are slightly higher in pre-U.S. market trading. In overnight news, the Euro zone unemployment rate for March was reported at 9.5%, which is unchanged from the February figure and in line with market expectations. The markets' data-point highlights of the week are the Federal Reserve's Open Market Committee (FOMC) meeting that begins Tuesday morning and ends Wednesday afternoon with a statement, and Friday morning's U.S. jobs report from the Labor Department. No change in U.S. monetary policy is expected at this week's FOMC meeting. However, as usual, the wording of the FOMC statement released early Wednesday afternoon will be parsed for any clues on future U.S. monetary policy moves. The key outside markets on Tuesday morning see the U.S. dollar index trading slightly lower. The greenback bears still have the overall near-term technical advantage. Meantime, Nymex crude oil prices are slightly higher but the bears have the near-term technical advantage. U.S. economic data due for release Tuesday includes the weekly Goldman Sachs and Johnson Redbook retail sales reports, the ISM New York report on business, the global manufacturing PMI, and domestic auto industry sales.